The Breast and Cervical Cancer Control Navigation Program or BCCCNP is part of a nationwide effort to decrease breast and cervical cancer mortality by providing breast and cervical cancer screening services for low to moderate income women who have no insurance or are under-insured. Screening services are available to women living in Ingham, Clinton, Eaton, Genesee, Gratiot, Ionia, Jackson, Lapeer, Livingston, Shiawassee and Washtenaw counties. Women who meet the eligibility guidelines may receive a pelvic exam, Pap test, clinical breast exam, mammogram and health education. Further diagnostic testing and treatment services are available to women who are found to have an abnormality through their screening. In addition to screening services, individualized assistance is available to insured clients to help them overcome barriers preventing them from receiving needed services. BCCCNP screening services for Ingham County are provided at the Ingham County Health Department Women’s Health Clinic or at the Cristo Rey Health Clinic. Multiples sites are available in the other counties that we serve. For additional information, please call our office. We are here to assist you in obtaining your breast and cervical cancer screening. 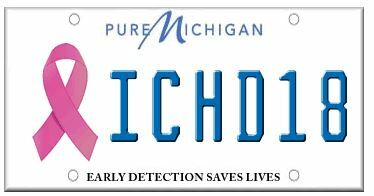 The breast cancer awareness license plate was introduced in 2014 and is available at Michigan Secretary of State offices. The plate promotes awareness of the importance of breast cancer screening. The license plate features the pink ribbon, widely known as the symbol for breast cancer awareness, along with an important screening message at the bottom of the plate that reads “Early Detection Saves Lives.” A portion of the proceeds from license plate sales will go toward MDHHS’s breast and cervical cancer screening services program to help ensure that eligible women in underserved populations have access to this important, and possibly life-saving, health resource. $25 will go towards the program when a plate is first bought and $10 each time it’s renewed. To purchase a plate by mail or fax, complete and print the Breast Cancer Awareness License Plate Order Form. Check for the availability of a personalized Breast Cancer Awareness plate using Plate it Your Way. Since 1991, the breast and cervical cancer screening services program, administered by the Michigan Department of Health and Human Services, has provided screenings to over 656,439 women and diagnosed 4,873 breast cancers and 6,453 cervical cancers. Having access to timely screening services and follow-up care can save lives. With this awareness, all women are encouraged to take this opportunity to talk with your doctor, because with regular screening, breast cancer is more likely to be detected at an earlier stage when it is most treatable. Among Michigan women, breast cancer is the most common newly diagnosed cancer. It is also the second leading cause of cancer deaths in Michigan women. In 2018, the American Cancer Society estimates 8,730 new cases of breast cancer will be diagnosed and 1,400 women will die from the disease in Michigan. Most insurance plans cover breast cancer screening, and women are urged to contact their doctor about screening options. Learn more about MDHHS’s breast and cervical cancer screening program.